You must make reservations at least 5 minutes in advance of the time at Cafe Portofino - Marriott Kauai. Free valet parking at Marriott. We have live harp music for our relaxing diners; and a nightclub / late night scene on Thursdays, Fridays, Saturdays. 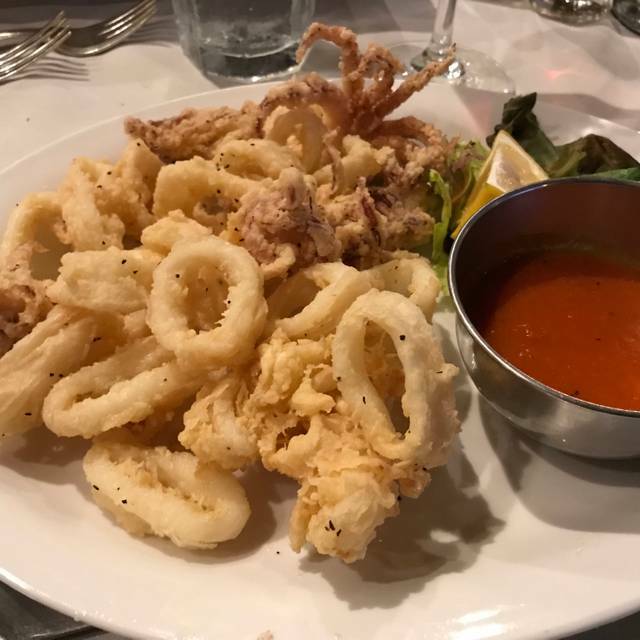 True Italian fare, but also specializing in Seafood and Steaks! Cafe Portofino overlooking the Pacific Ocean off of the beach side at The Kauai Marriott resort has been called "A honeymoon destination' by Martha Stewart, and 'one of the top 10!' by Gourmet Magazine. Please come and enjoy the gentle tradewinds and enjoy a classic dining experience. The food and the service was excellent. The waitress was excellent. This is not our first time. That why we keep coming back. The atmosphere was perfect for a nice dining experience. The food was not good. The fettuccine noodles were identical to to store bought egg noodles in a bag. I was shocked. We had two veal dishes. Both tougher than skirt steak. Likely due to meal preparation as opposed to food quality but hard to gauge considering I have never had tough veal before. We brought it to the owners attention who decided to educate us on there actually being no problem and that it is suppose to be both fat, tuff and full of leaders. Real shame given the potential in light of the restaurants location. We ate next door at Dukes a few times and would certainly recommend it as an alternative, until the food quality improves. I took time to meet the owner, Gino, and he was gracious. This was the best Italian meal I have ever eaten outside of our family dishes. I just wish there was another one near my home! The service was awful. My husband asked the manager if they could do a little something since it was my birthday. Not only did they not acknowledge it they pretty much ignored us when we left. Such a pretty location but we won’t be back. Outstanding! Out waiter was the best. Great food and atmosphere. Would highly recommend it. This was a great experience. Traveling to HI with a friend that doesn’t get to travel much. This was our special dinner- wonderful! The view from our table wasn’t as exotic as I thought it would be based on the reviews I read. I felt the table service was a little slow even though we weren’t in a rush. Our drinks were a little slow to be refilled. I do have to say that the food was excellent. When we got the bill, we told the waitress that we would like to use our resort certificates and was told by the waitress that we were only able to use one $25.00 certificate and that it was stated on the menu. 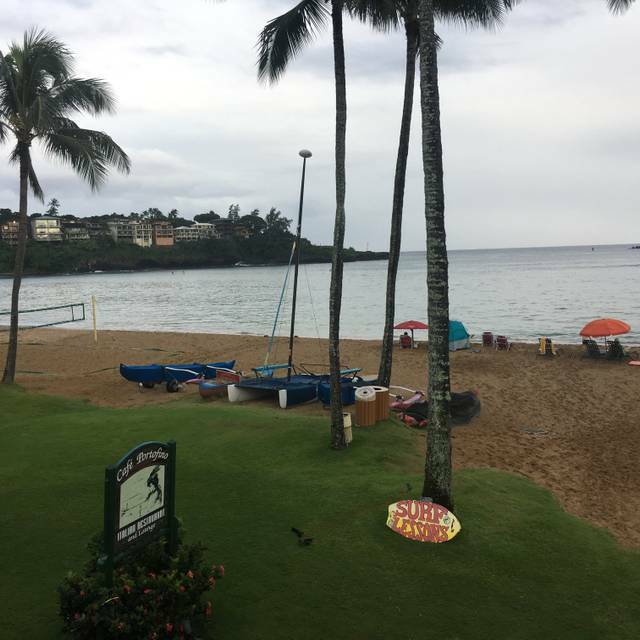 We’v Been coming to Kauai over 20 years and used those certificates for excursions, and restaurant dining and your restaurant is the only one that refused to accept certificates for the entire bill. This was very disappointing . It’s not that we didn’t have the means to pay but felt that we should have been able to use the amount of certificates that would have covered our bill. To me, I felt the certificates should have been as good as cash. That was probably my main complaint. Based on the entire experience from beginning to end, we won’t dine in your restaurant when we return. We thoroughly enjoyed our experience. Our waiter was excellent as was the food. The ambience and setting were perfect - we were celebrating my wife’s 65 birthday, and the evening was perfect. I have already recommended the restaurant to friends who vacation in Kauai regularly as well. We always have a great meal but usually feel this restaurant is short on staff and we hardly see our server because they are covering so many tables. We also have noticed hat our receipt is never correct, missing a drink or not charged for the correct drink, food, etc. We love the food but more help staff would b appreciated. The restaurant was decent but I wouldn't return there myself, so I wouldn't recommend it to someone else for that reason. The serving staff was the highest point of the experience, they were attentive and wonderful. 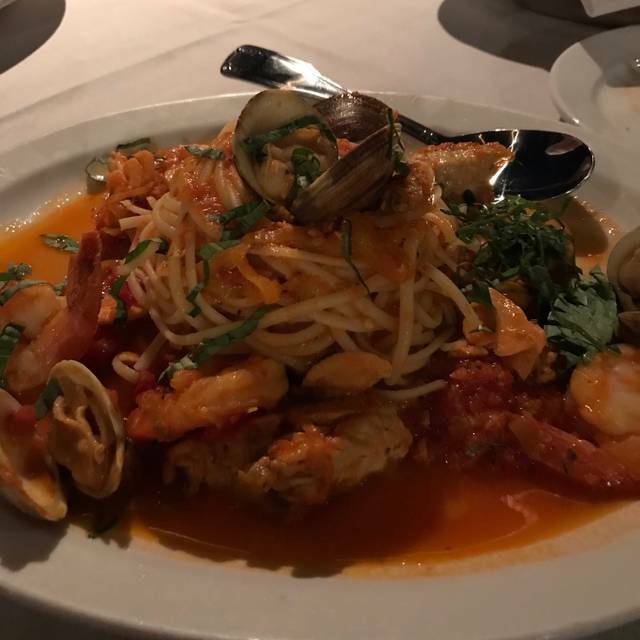 The food was basic, I've had much better at Italian restaurants. We love Cafe Portofino and dine here on every Kauai vacation (over 20). The food is excellent and we always get good service that is attentive but not rushed. The owner is a gracious host, and the talented harpist adds to the ambiance. 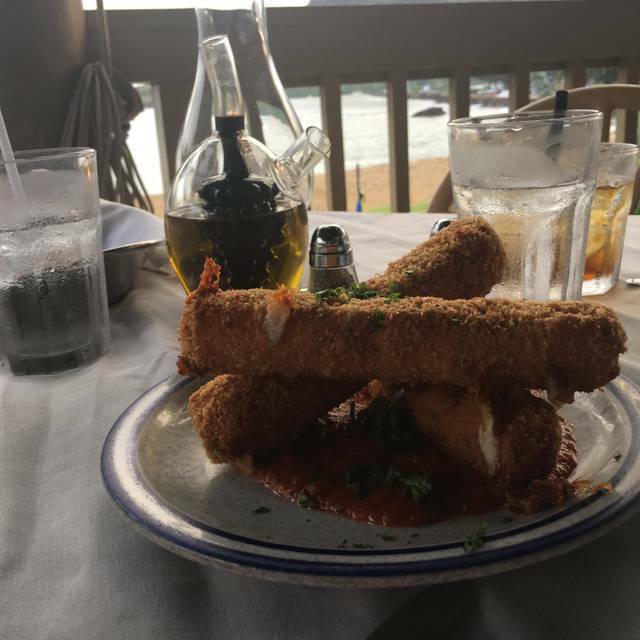 Where else can you get excellent Italian food while being serenaded by harp music at a table overlooking an idyllic harbor? Nowhere I’ve ever been! Worst restaurant ever, read my Trip Advisor review for the gory details of this 70th birthday disaster! Our experience started with a 25 minute wait to get the wrong drinks and to learn that the bar does not stock 7-Up or ginger ale Which is commonly used in many mixed drinks. The food was OK but the communication between the staff and the bar and the customer made what could have a pleasant dinner very uncomfortable. As a result the main course took over a hour to receive. Beautiful view ruined by poor management. Didn’t think the food was high quality, also didn’t like that they charged for soda refills. This dinner was absolutely wonderful and the staff was so friendly! 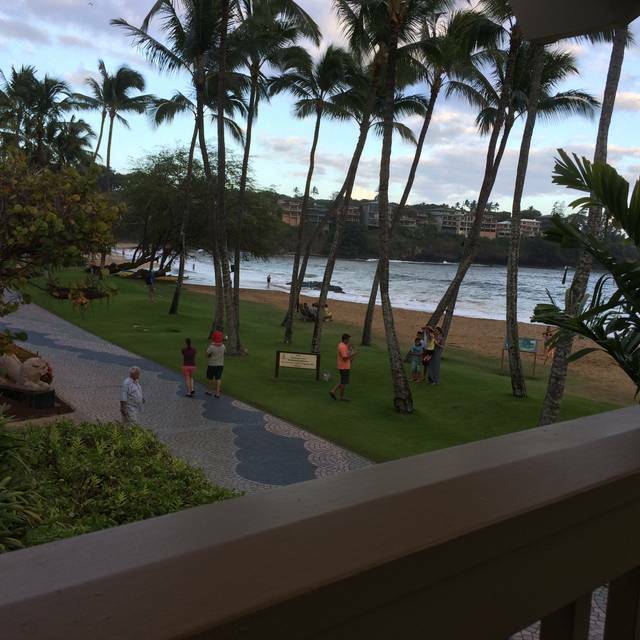 Great ambiance and a gorgeous view- would definitely recommend if you ever find yourself in Kaua'i. Waiter was slow and confused orders. I ordered the wine but the waiter asked another person in our group to try it. Food at the next table had to be sent back because of his mix up of orders. Took our friends out to dinner before they returned to mainland. Was perfect meal fabulous service wonderful atmosphere! Food not as good as our last visit in October 2017. Small portions were disappointing. The chair I sat in was stained and I tried to ignore it. But since you want a report they should’ve offered me a better seat! Yuk! Special of the day (Diablo pasta) wasn’t spicy at all. Pasta and fish didn’t taste fresh. Excellent meal and service. Loved the harp playing in the background during our meal. We had a really nice dinner at Portofino’s and great service from our exceptional waiter Michael. He really made our special day extra special. Whenever we get to Kauai, we make sure that Portofino in on our list. The Harp player was really special and the iwner is always so gracious. The Meat Lasagna was just awesome! Real Italian, I was skeptical but surprised. I started with the escargot, to be honest it wasn't the best that I ever had but it was ok. I then had the seafood diablo and that was very good. They had a very nice menu, and if I had more time in Kauai I definitely would try the rack of lamb. Did not ask if we wanted dessert. We probably will try again and hope for a better waiter. Note: it is easier to walk through Dukes to get to the restaurant, particularly if one in your party has trouble with steps. We have always been pleased by the food and service and never been nervous about taking friends there. The tables on the porch were a treat as we were able to look out at the ocean during dinner. The menu was full of good choices and our dinners were very good. However, the escargot appetizer was disappointing as it did not have any flavor--usually there is a strong garlic flavor. These tasted like they were dropped out of a can and heated up. Other than that, we had a lovely dinner there. Dining experience was mediocre at best. 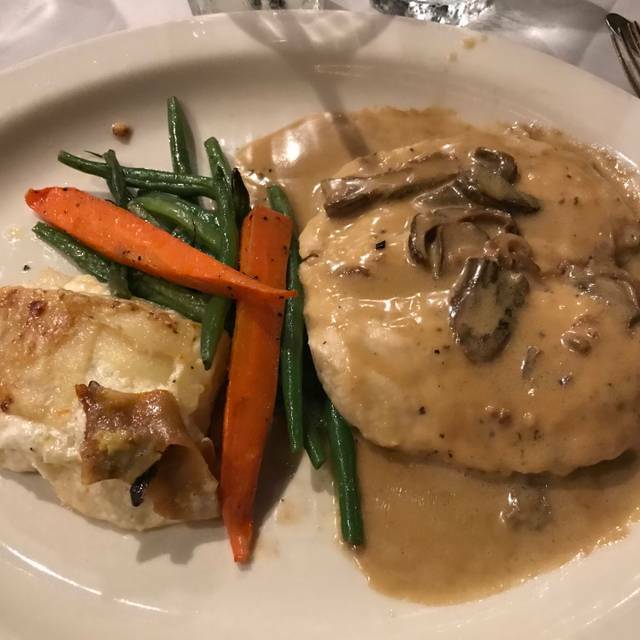 The chicken Marsala was extremely bland and both of our portions were tiny for the price point. The waiter was great though. Personable and professional. We will not return. Wonderful food, beautiful location. I highly recommend. This was our last dinner on Kauai and it was spectacular! Outside dining with a great view of the beach, the water, and the sail boats. Live harp music and an attentive and cordial waiter and delicious food! I am recently gluten free & they had scrumptious GF pasta so I didn't miss out on Italian!!!! 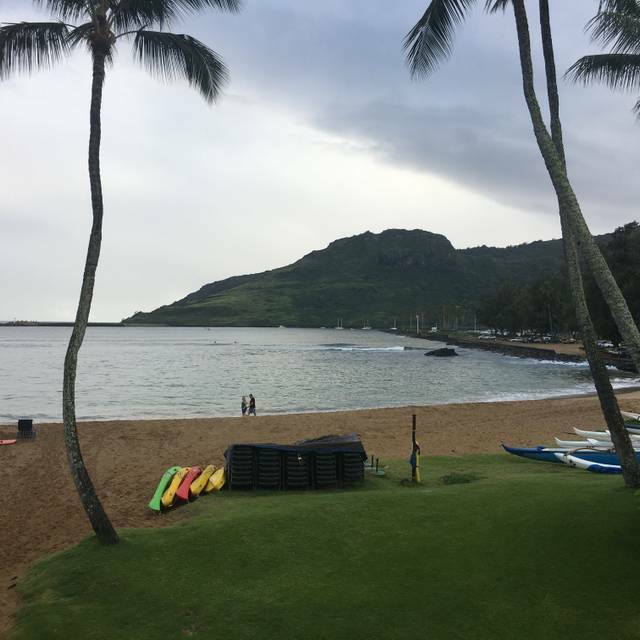 We came here the first night we were in Kauai and were so glad we did. The food was very good, my husband and I had been wanting carbonara for quite some time. This dish was wonderfully prepared and very delicious. Our friends had the scampi and the lasagna, and they agreed that they would come back again too. The view of the bay and the tikis is so soothing. Thee live music that evening was a fantastic harp. It was a great evening. Cesar salad was bland and soggy. Price was high for experience. We arrived prior to our reservation time and were told to wait. While we were waiting they seated two other tables of two.....at tables that could fit our three. I had asked for a table on the side as my mother has hearing issues but they disregarded that request. Our server was good but the host up front was very stuck up and unfriendly. The food was not up to par. We ordered appetizers and we couldn't finish one of them as it was awful. Our main courses were not that special either. I would not recommend this restaurant ever. We dine here a couple times a year for the last 5 years and have not experience anything less than perfect. Reasonably good food marred by lackluster service and no sommelier (and a manager with no demonstrated knowledge of the various wines). Overall the restaurant is trying too hard to be "genuine Italian" and instead is more like an insincere Las Vegas imitation.